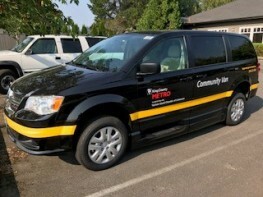 Community Van is a new rideshare pilot program brought to you by King County and The Vashon Maury Island Chamber of Commerce to provide Islanders with a new way to share the ride. This is the latest in a series of unique Community Connections Metro is piloting in communities throughout King County. These services are designated to provide residents with customized options for getting around when bus service can’t meet their needs. Accessible Community Vans are available upon request. Tell the Community Transportation Coordinator about your needs before your trip. Click the Trip Schedule button below to see a list of trips that are scheduled with the Vashon Community Van. If you’d like to share the ride for any of these trip contact the Vashon Community Transportation Coordinator via email or call 206-773-7003. Step 1: Download, complete, sign and email your Community Van Driver Application. Step 3: Start Driving! Once you become an approved driver you will be able to use the van. Fares are round trip and are priced at one zone off peak, which is $2.75. Click Here for KC Metro Fares. Use the Transit to Go App on your phone: Click here to for more info. The Vashon Transportation Hub is located at the Vashon Maury Island Chamber of Commerce Office. Community Transportation Coordinator can be reached at 206-773-7003 or Email. For More Info about the King County Metro Community Van Program visit their webpage here! Community Van is a new rideshare pilot program brought to you by King County and The Vashon Maury Island Chamber of Commerce to provide Islanders with a new way to share the ride. Use this form to request a trip. All trips require at least two confirmed riders and a King County approved volunteer driver. Fairs must be paid by riders in advance of trip.